​RAM of CNY, Inc. specializes in waterfront construction. We are dedicated professionals with over 30 years of experience in all aspects of the trade. 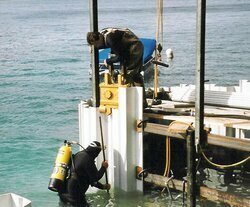 We use only the best materials available, and stay informed of the latest products, construction methods, and technological advances in the marine trades. We are committed to working with you to enhance the beauty and value of your waterfront property. Our office is located in Central New York, and we have completed projects on many Central New York waterways and lakes, including many of the Finger Lakes, the St. Lawrence Seaway, Alexandria Bay area, and Lake Ontario. We also offer full permit application preparation services, such as necessary permits from the Department of Environmental Conservation, The Army Corps of Engineers, New York State Coastal Management Program, New York State Department of State, New York State Canalized Waterways, and any applicable township and zoning permits. We also offer the services of a licensed Master Pilot (100GT).